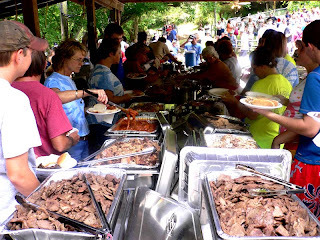 For the past twenty years the residents of Richlands Virginia have gathered at the Little River for a community pig roast. The setting is idyllic. 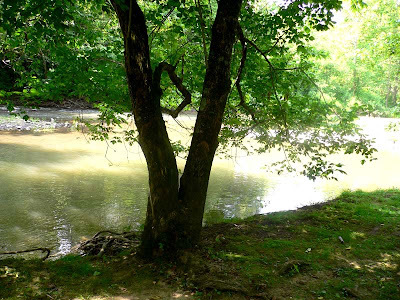 The Little River is surrounded by woodlands and flows gently into the larger Clinch River. For the day of the festivities, volunteers stretch netting over a section of the river to prevent errant inner tubes from flowing away. Children and teens spend the day floating over the rocks in the tubes and jumping into the river from a rope swing. Canoes are also provided. 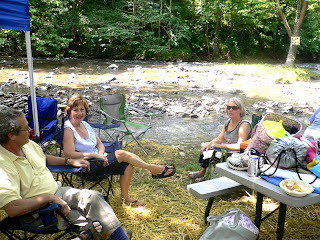 Families bring their lawn chairs and establish their vantage points along the banks of the river. Barbara and I have a very good spot. The main event of the day is the unveiling of the roasted pig. On Friday night a deep hole is dug and a fire started. Rocks are placed over the burning fire. Collard greens are added to perfume the meat. The dressed pig and other meat, usually deer and turkeys are placed in wire cages and lowered into the fire pit. The meat is covered with wet burlap and canvas. 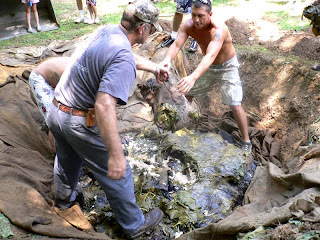 The pit is then covered with dirt and the meat is left to cook overnight. 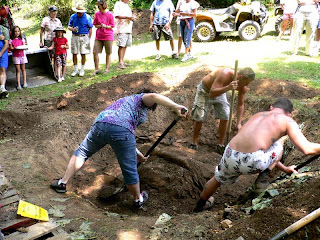 On Saturday at 1:00 PM volunteers start digging the meat out of the still smoking pit. 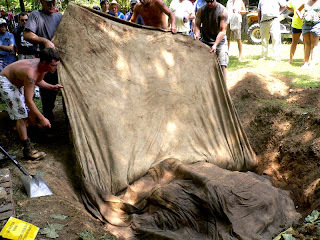 The burlap and canvas are removed. The greens and meat are exposed. In this picture a wire cage containing turkey is being removed from the pit. After the meat is carved it is taken to the food tables where hungry people line up for the feast. The smell of cooked greens and roasted meats draws everyone forward. Although the pork and other meats are the stars of the show, the contributions of covered dishes by the community are not to be believed. 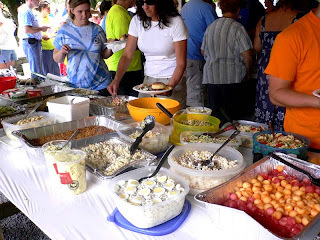 Casseroles, salads and desserts are so numerous that even if you are at the back of the long line there is always plenty to go around. 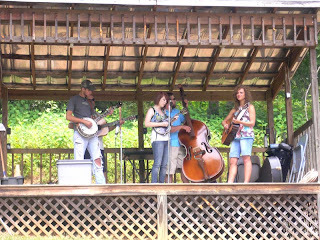 While friends and neighbors eat alongside the river they are serenaded by a series of talented bluegrass bands. My husband and I have been fortunate to be invited to this event for the past four years. We always look forward to it. There is something very special about the gathering of friends and neighbors, young and old to share a day of fun, food and fellowship. The ladies of the community have published a pig roast cookbook. Of course I bought one. I will be sharing some of the recipes in later posts. Posted on July 19, 2009 at 6:35 am.